It’s not hard to see how romantic Hot Tubs can be in the right setting. Imagine spending quality time enjoying each other’s company and just taking a minute to unplug from the world around you. Now, imagine easing tired muscles, restoring inner calm and renewing energy levels in a warm, bubbly Hot Tub at the same time! Creating the perfect setting for romance is easy with a little time and planning. Just follow our 10 top tips for Valentines success! 1) Planning is key. Organise for kids to stay away at friends or grandparents’ houses, or if they have any social clubs of an evening just let them know that you will be stealing your partner away for the night! There’s no bigger mood killer than foregoing your date night because your partner had already made plans. 2) Make every little detail count. Everyone knows that the showstopper is the evening itself, but what about making the invitation a little special? Let your loved one know your plans ahead of time by giving them a handwritten love letter inviting them to spend the evening in the Hot Tub. 3) Splash out on new robes. The only thing better than getting out of a Hot Tub feeling refreshed, is getting out of a Hot Tub and slipping into a nice new, fluffy robe to walk back to the warm house and continue the evening. 4) Turn off all distractions. Tonight is the night to spend quality time with your partner, with no distractions. Switch off your phones and leave them in the house so you can be present and in the moment with your loved one. 5) Don’t forget the chocolates… Chocolate is the timeless romance classic. Dip your favourite fruit in melted chocolate (think strawberries, chopped banana, apple slices, cherries…) for a delicious addition to your ot HHfHot Tub date night. - In a cocktail shaker, muddle a handful each of blueberries and raspberries, and a sprig of mint. - Add 30ml lime juice, 1 tablespoon of honey, and come crushed ice. - Shake until well combined (if you don’t have a cocktail shaker, pour back and forth between two glasses until combined). - Strain the mixture over some more ice and top with a splash of soda water. 7) Switch on the music. There’s no better way to set the mood for a romantic evening than having music on in the background. A safe bet is sticking with your partners favourite band or genre, or if you want something a bit more traditionally sensual, you can’t go wrong with a bit of Marvin Gaye! 8) Take advantage of aromatherapy. Take the romance up a notch with a light fragrance to tantalise the senses! 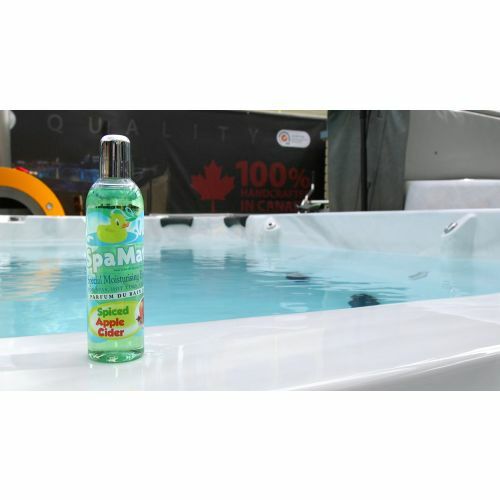 There’s no need to faff around with essential oils and doses, you can just add a capful of our Spamate aromatherapy to your Hot Tub! 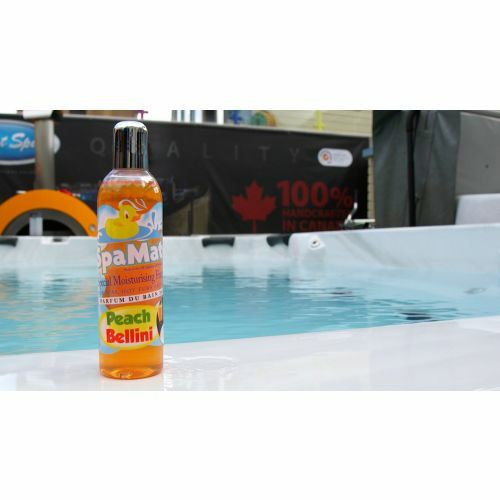 Our favourite scents for a romantic Hot Tub date night are Rocky Road, French Vanilla, and Peach Bellini – delicious! 9) Lighting is everything. Whether you go for romantic lanterns, twinkling fairy lights or traditional candles, getting the lighting right is perfect for making a romantic atmosphere. 10) Give a little bit of privacy. If your Hot Tub is out in the open, it’s a great idea to put up some privacy screening (or better yet, indulge in a luxury Hot Tub Enclosure!) to create a cosy little space for cuddling up to your loved one this Valentines. 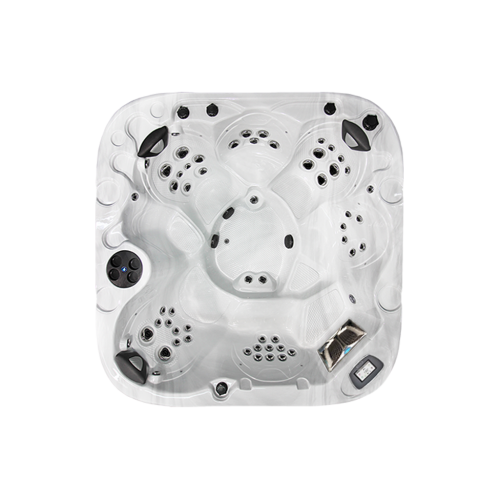 If you’re looking for intimacy and sharing great times together, the Coast Spas Tublicious is the perfect hot tub. Sit opposite each other in the comfortably hot water with bubbling jets tenderly tickling you all over your back and neck. The Tublicious is for 2 people, so there is no better place to kindle intimacy and reconnect with your soul mate! 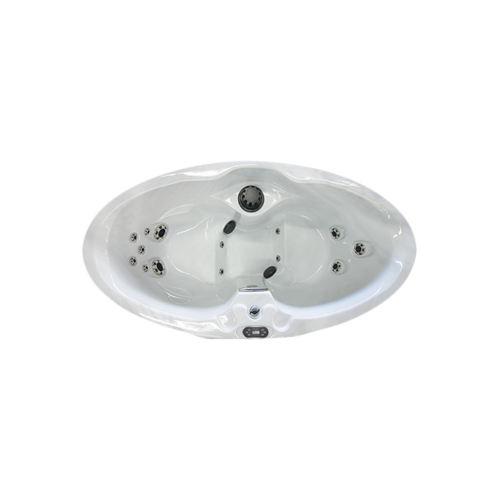 For more space and choice of seating, the Coast Spas Element B Hot Tub offers many more seating options. Colour changing, underwater lights with lit waterfalls create an idyllic ambience and tingling air jets gently tickle your body and ripple the water. The Element B has a variety of seats for bathers of varying heights and body shapes - the large footwell especially, makes moving around in the hot tub much easier. The cleverly designed higher seats are there for smaller bathers and help you cool down by lifting your body out of the water – especially beneficial if the hot tub experience becomes too steamy! Now you’re fully prepared, let’s get back to that blend of champagne, strawberries and hot bubbling water with a beautiful aromatherapy sensation - the scene could not be more perfect for the ultimate Valentines date night.